The past couple of Topboxes have been pretty good, value wise. This month however…. I am feeling very underwhelmed. – Like I previously stated, this is another nail product from the same brand. Though it is a top coat, it would have been nice to receive something else to try! I currently use the Butter London top coat and I very much like it, so I will have to see how this one compares. – Let me just start off with saying that I saw this product in my box and was instantly underwhelmed because the size of this sample is what you would expect to receive complimentary from places such as Shoppers Drug Mart. I would not consider this a “deluxe” sample! Anyways, this product claims to diminish imperfections and marks. It comes out as a clear gel and absorbs nicely into the skin. – Can we also talk about how small this sample is as well?! On the back it reads “Free sample – not for sale.” The colour is very pigmented and the packaging is cute, but I feel like this is also not a “deluxe” sample as stated in Topbox’s claims. This month’s box was not as great of a value as these past previous months. I previously went on a rant about how some products I received were not deluxe sized in my opinion and then it went uphill for a couple of months, but now with this month, I feel like this hits the spot with my opinions. I also received two products of the same brand, and yes they are full size, but I would have liked to see another product from a different brand to try out. 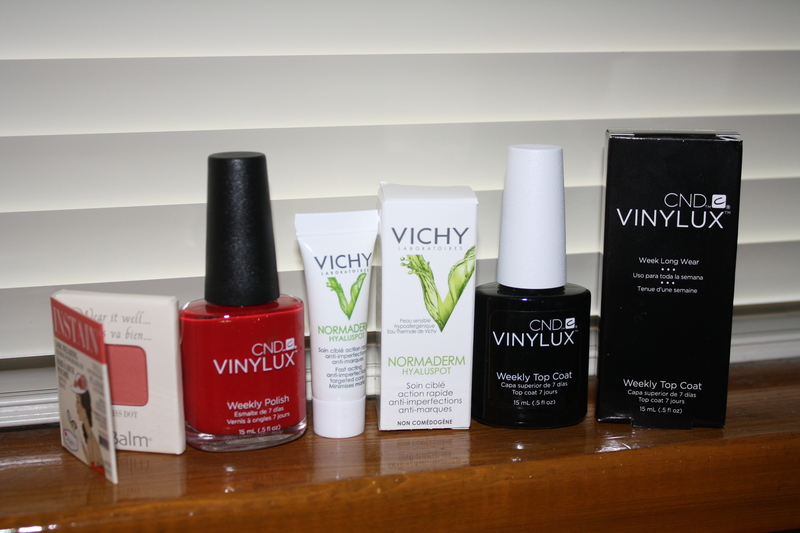 I got two polishes plus the topcoat! (And then, like you, one skincare product and one blush.) Weird that some people got more polishes than others!